This website is the result of a three year investigation of the D.B. Cooper case by a group of citizen scientists. The case has taken on historic proportions in the mind of the public and remains the only unsolved skyjacking in U.S. history. It is important to stress, that NO government money was spent on this investigation. 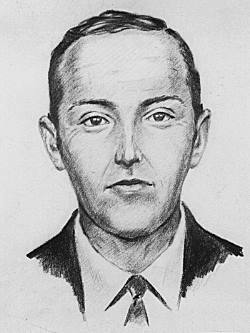 In 2007, through the efforts of Special Agent Larry Carr, the Cooper case was opened to the public and our group was allowed special access to the evidence and the files in the FBI archive. Special Agent Carr allowed this with the specific intent of having the case worked on without spending federal dollars, which was exactly the result. Our investigation of the case primarily revolves around analysis of microscopic particle evidence lifted from D.B. Cooper's tie. All of these particles are too small to be seen with the naked eye, but modern science can now track them to their source. These particles through their shape and composition can tell a story, but they are inherently difficult to work with because they often represent one very, very small piece of the actual evidence. In some aspects of this investigation, multiple lines of evidence pointed to the same answer, and in others, only a single clue was available to shine a light down a dark tunnel. It should be understood up front that the information presented here represents the best deductions of the researchers on what is certainly a very cold case. Readers must also remember that new evidence can change these interpretations dramatically and the D.B. Cooper case must still be considered a work in progress. As Special Agent Carr and the Seattle Field Office of the FBI did previously, we are now sharing our new information with the public, in hopes that our research will provide a spring board to new clues and connections that may finally bring this case to a close after four decades. Any and all information and content presented here is solely the work of the Cooper Research Team and only they are responsible for its content. The team is aware of previous outside references to our research. We feel compelled to state that some of those statements are factually incorrect. and all the Citizen Sleuths that assisted directly and indirectly with this project.